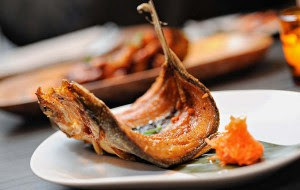 “Maharlika is a gateway restaurant — an exotic excursion with a soft landing, a chance to discover an unsung cuisine without getting too down-and-dirty.” says the writer of Authetic Filipino Moderno review at NY Times. It started in January as a pop-up weekend brunch then finally got a space in August at East Village. The owners — three young Filipino-Americans, Nicole Ponseca, Enzo Lim Noel Cruz, and Dominican chef, Miguel Trinidad. The ambiance of Maharlika the way it is descibed is very Filipinoish - like one is eating back home: a Capiz shell lamp, blown-up photos of the Filipina Miss Universe of 1973 Margie Moran, flamboyantly painted jeepney and portrait of José Rizal.